Snack Pak 4 Kids Canyon is a program operated by the nonprofit organization Canyon Hope Ministries. It provides Snack Paks each weekend of the school year to Elementary, Intermediate, Junior & High School students. The Snack Paks consist of fruit juice boxes, pop tarts, cereal, peanut butter crackers, pretzels, animal crackers, fruit bars, beef sticks, ravioli & peanut butter. Snack Pak bags are packed by volunteers, delivered to the school and discreetly placed in the children’s backpacks to be sent home each Friday. Many of these kids would not eat from lunch at school on Friday until breakfast at school on Monday without the generous donations and support from our community! 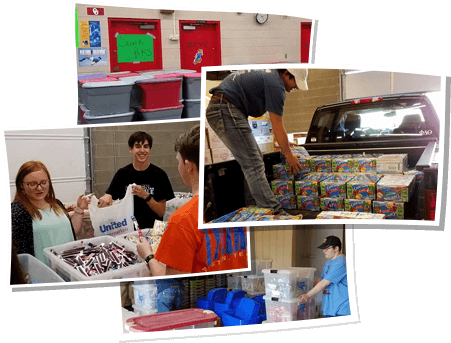 1,149 children...with the addition of Pinnacle Intermediate to our program --we have surpassed 1100 children in CISD receiving Snack Paks. Thank you for your generous support! Each of you are so greatly appreciated! RHS/WTAMU student volunteers - 4:30 P.M. -6:00 P.M.
Hillside Christian - Canyon Campus - 6:00 P.M.
First Baptist Church - Canyon - 6:30 P.M.
Noon/Lions/Leos/Happy State Bank - 7:00 P.M.
WTAMU Lady Buff Softball - 7:30 P.M.
Next in Stone - 5:30 P.M.
Methodist Church/City of Canyon - 6:00 P.M.
*RHS/WTAMU student volunteers - 4:30 P.M. - 6:00 P.M.
CHS - Golf - 5:30 P.M.
4-H Clubs - 6:30 P.M.
Christ Family Fellowship - 7:00 P.M.
Lady Buff Soccer - 7:30 P.M.
CHS Campus organizations - 5:30 P.M.
Hillside AMA/University Church of Christ - 6:30 P.M. It is with great excitement we invite you to participate in the 7th annual Snack Pak 4 Kids Canyon – Golf Tournament. It will be held at the Palo Duro Creek Golf Course on Friday, September 7th, 2018 - 1:00 SHOTGUN start! 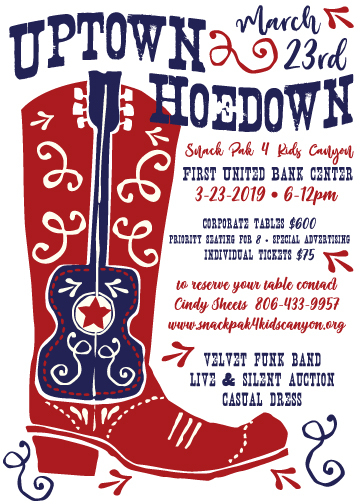 Benefits from the fundraiser will go towards providing week-end snack paks for children in need in the Canyon School District. We are blessed to say that the Snack Pak program is being facilitated in all 16 schools in the Canyon School District. Currently we have grown to close to 1100 students on the program with additional children being added to the list every day. In addition to providing snack paks in the school year, we were so excited to provide our snack paks to the summer school students at Canyon Intermediate School this summer! The Golf Tournament is one of our largest fundraisers of the year! We anticipate a great turn-out and hope that you will be able to join us! Exclusive hole sponsor. Sign provided for event. (Price does not include a team). Shared hole sponsor. Sign provided for event. (Price does not include a team). If you would like for us to reserve space for your team &/or you wish to take advantage of our sponsorship opportunities–please contact us immediately to guarantee space. Simply register by phone (Cindy Sheets 806-433-9957 Elsie Rempel 806-676-4933 Patti Adams 806- 363-0425) or fill out the registration form and return to us by email (snackpak4kidscanyon@gmail.com) or mail (PO Box 526 Canyon, Texas 79015) at your earliest convenience! For Banquet ticket and payment options please call Cindy Sheets at 806-433-9957. On behalf of Snack Pak 4 Kids Canyon, we would like to thank you for your support. Your commitment to helping the children in our community is sincerely appreciated. Each year, Snack Pak 4 Kids Canyon continues to advance its mission of ending weekend hunger. For as little as $14 a month, you can make a difference in the life of a child. For more information on food drives and donations or to volunteer, please contact Cindy Sheets at 806.433.9957. We simply would not exist without the generosity of the many volunteers in our community. There are many ways that you can help! Teams, organizations, families as well as individuals are all welcome to participate! 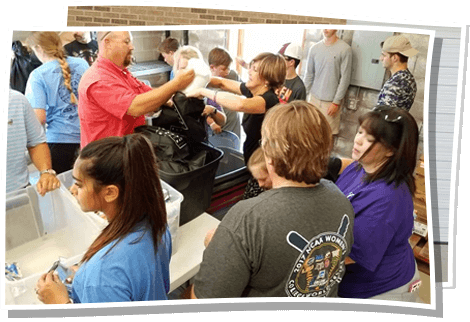 We appreciate volunteers assisting as Food Drive Coordinators, Monthly Packers, School Delivery & Distribution, Restocking Teams, and Trash and Recycle Crews. If you are making a food donation, please deliver all items at our new location of 11805 I-27 Suite D. We are located right behind Choice Media. 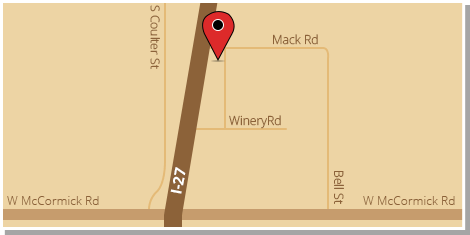 Lacie White-Farmer's Insurance Agency (2001 4th Ave Suite #5). We are Canyon people helping Canyon children and your donation matters! To donate, pledge or sponsor a child click on the PayPal buttons below or click here to print and mail our form to PO Box 526, Canyon, TX, 79015.